Sheehan's syndrome is a condition that affects women who lose a life-threatening amount of blood in childbirth or who have severe low blood pressure during or after childbirth, which can deprive the body of oxygen. In Sheehan's syndrome, the lack of oxygen can damage your pituitary gland. Sheehan's syndrome causes the pituitary gland to not produce enough pituitary hormones (hypopituitarism). Also called postpartum hypopituitarism, Sheehan's syndrome is rare in industrialized nations, largely due to improved obstetrical care. But it's a major threat to women in developing countries. Treatment of Sheehan's syndrome involves lifelong hormone replacement therapy. Signs and symptoms of Sheehan's syndrome typically appear slowly, after a period of months or even years. But sometimes problems appear right away, such as the inability to breast-feed. For many women, Sheehan's syndrome symptoms are nonspecific and often thought to be caused by other things. Fatigue, for instance, goes hand in hand with being a new mother. You might not realize you have Sheehan's syndrome until you need treatment for thyroid or adrenal insufficiency. It's also possible to remain relatively symptom-free with Sheehan's syndrome, depending on the extent of damage to the pituitary gland. Some women live for years not knowing their pituitary isn't working properly. Then an extreme physical stressor, such as severe infection or surgery, triggers an adrenal crisis. Sheehan's syndrome is caused by severe blood loss or extremely low blood pressure during or after childbirth. These factors can be particularly damaging to the pituitary gland, which enlarges during pregnancy, destroying hormone-producing tissue so that the gland can't function normally. 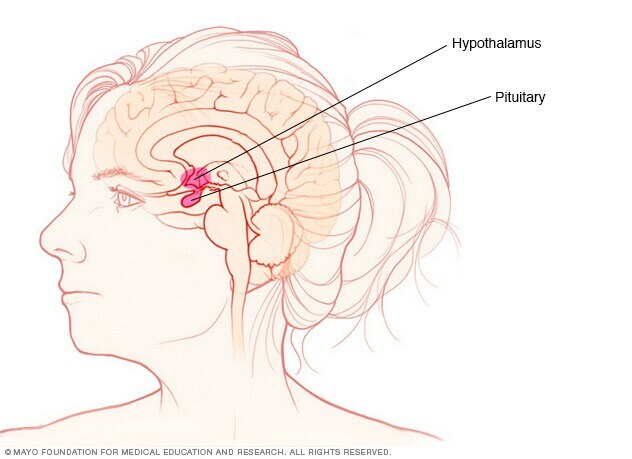 Pituitary hormones regulate the rest of your endocrine system, signaling other glands to increase or decrease production of the hormones that control metabolism, fertility, blood pressure, breast milk production and many other vital processes. A lack of any of these hormones can cause problems throughout your body. Luteinizing hormone (LH). In women, LH regulates estrogen. Follicle-stimulating hormone (FSH). Working with LH, FSH helps stimulate egg development and ovulation in women. Adrenocorticotropic hormone (ACTH). This hormone stimulates your adrenal glands to produce cortisol and other hormones. Cortisol helps your body deal with stress and influences many body functions, including blood pressure, heart function and your immune system. A low level of adrenal hormones caused by pituitary damage is called secondary adrenal insufficiency. Any condition that increases the chance of severe blood loss (hemorrhage) or low blood pressure during childbirth, such as being pregnant with multiples or having a problem with the placenta, can increase your risk of Sheehan's syndrome.